Battersea Sports Centre is based in the heart of the Battersea community offering indoor and outdoor activities for adults and young people. This class takes place in the Gym for members only and is run by Battersea Sport Centre gym team. Booking essential as class only holds 5 members, book at reception or call 0203 959 0050. Come and join our friendly mixed ability group at Battersea Sports Centre to improve your game while having fun. Need a helping hand? Don’t hesitate to ask out qualified coach Mac! Battersea Sports Centre runs a fun multi-sports activity holiday programme for children aged between 6 and 13. These fun days for kids run from 10am to 3pm each day of school holidays. Lunch for the children is at 12 noon each day (please provide your child with a packed lunch and a drink). 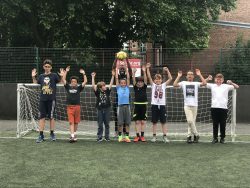 The children will be trying their hand at a range of sports that may include; football, kwik cricket, benchball, treasure hunt, short tennis, basketball, volleyball and lots more! Please Note: Children under 18 require adult consent, please download and complete a consent form below before participating in any classes. We have a multi-station gym available for use for age 14 + ( under 18’s will need parent/guardian consent), with various different memberships offering flexibility and convenience, including pay monthly, pay per session and concession options. We offer a wide range of exercise classes to suit all ages and abilities, please click on the link below for full details. Enable My Fitness – A mixed gym session incorporating cardio vascular, muscular strength and endurance and core work. KeepFIT – a low impact class combining stretching and cardio to get the blood pumping. LBT – Legs, bums & tums – high intensity class targeting the specific areas of the body to shape and tone. Zumba Party – Get your sweat on with a fun, high intensity class that involves combining moves from salsa to street dance. HIIT – A high intensity interval training class that teaches you a variety of kettlebell skills and programmed to get the heart racing, whilst toning and conditioning the body. Yoga – A 60 minute class of meditation, stretching and breathing. Pilates – A Mat based class working on posture, balance, breath, coordination, strength, alignment, flexibility and mobility. Full-sized indoor sports hall with markings for volleyball, netball, basketball, badminton and football. Centre memberships range from £17.50 – £35 please call Battersea Sports Centre for further information. 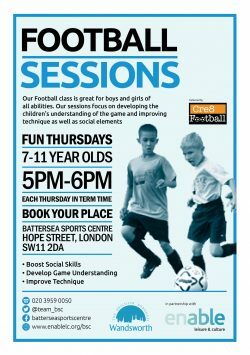 Juniors under 18 attending sessions require adult consent, please contact Battersea Sports Centre directly for further information. Battersea Sports Centre reserves the right to make changes to the class schedule and we will endeavour to inform our regular centre users. 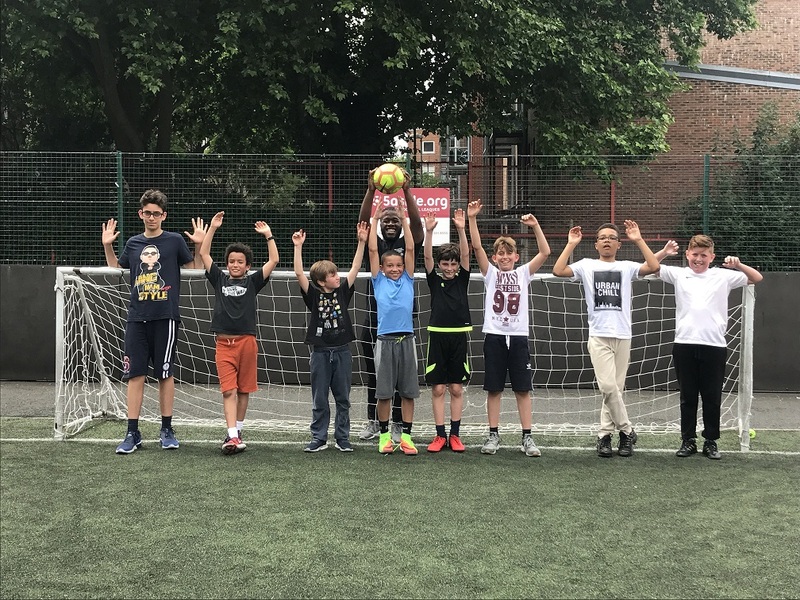 Battersea Sports Ce ntre runs a fun multi-sports activity holiday programme for children aged between 6 and 13. These fun days for kids run from 10am to 3pm each day of school holidays. Lunch for the children is at 12 noon each day (please provide your child with a packed lunch and a drink). The children will be trying their hand at a range of sports that may include; football, kwik cricket, benchball, treasure hunt, short tennis, basketball, volleyball and lots more! Is your child aged 6 to 13? Why not try one of our excellent sports parties. Your child will have a great time at one of our football, multi-sport, badminton or short tennis parties. Our qualified coaches will make it a day to remember with tournaments and games. We also have a seated area to eat food (please note all food must be pre-prepared as kitchen facilities are not available). Birthday parties are limited to a maximum of 20 children. If you are interested in making a booking give us a call to check availability and then complete and return a Birthday party booking form. Schools and community organisations can book a sports facility at competitive prices throughout the year. If your school or group is interested in booking our facilities please complete a booking form and either post it or email it to us. We have a room to hire that has great lighting and space for a physiotherapy bench or a massage bed. There is a working sink, and the room has a lockable door for private consultations. Give us a call to enquire or email us a booking form.